The quest comment states that they can spawn in random locations. I found this item at Ighaulk Crag atop a small mountain shaped rocky structure. Again, you will see a gold cog on your minimap. Zero level of difficulty in gaining access to the item. Jump around the rocks until you find a spot that gets you up to the slate leading to the top. No items or special abilities are necessary in gaining access to this item. Some as not possible to get pfff troll more blizz comeone man ! You may need to be in Saurok form to reach this, as then you have access to their massive jumping ability. Which means you would have to have completed those sets of daily quests, but at the time you get this quest, that should pretty much be a given (it might even be that the quest does not unlock until you have done it). this screenshot is completely inaccurate and i added a new one ..its at 53/73 for coords and is always there .. no randoms places for these items of the quest! Found it at 48-83 on top of the peak; it is not in the cave below. Go around back and jump up to the top right side of the peak. i found I hated this quest. As a horde player, and the lack there off, and huge numbers of alliance players..and no phasing..yawn. The problem is, this quest is a pointless horrible waste of time, no matter the hour of day or night. Best advice, don't bother, you have plenty of dailies to be getting on with. There is one that spawns in saurok, unfortunately it spawns right on a place you cannot reach, forget the jump ability..clearly it must be a bug, also if left unclaimed it apparently respawns somewhere else in the same area. Additional location... Found at the *very* top of the rocky mountain peaks - south of the "filth pool" and north of the shore. There is no direct path up the mountain peaks here, instead use the Saurok jumping ability to navigate back and forth up the slopes. You get an extra strong jump by double-hitting the spacebar in quick succession. Exact coordinates: 50.9, 85.4 - A small set of gears appears over the item. It seems the Shoulder item is found at the top of one of the peaks, it seems to be random, but you can get to the top of them and i believe there is 5. 53.4, 83.5 on top of a peak. I found it today, but apparently I posted the comment on the wrong page. This is the link to my comment on the Shoulder of Chamberlain container page here on wowhead. I found one at 57,81 close to the base of the hill/mountain there, overlooking the ocean to the east. please someone confirm if only pve can see him and correct me if I am wrong. U can always use Skumblade Brute ability Brute Slam to make your jump longer. If u jump, 0,1 second before end of casting of Brute Slam, u will jump farther than normal. Thanks to it, I get my Shoulder of the Chamberlain without Saurok form. I got myself up onto the hill where Progenitus spawns, popped a Noggenfogger elixir until I got slow fall, mounted up, ran and jumped for it, then released slow fall once I was over the spot where the shoulders were. It was much faster than waiting for another daily to maybe/maybe-not appear for me. For me, the shoulder was o nthe tip of a mountain that seemed impossible to get to. It took me a minute to figure out but if you attack the rare on the top of the camp called Progenitus, he does an attack called "Unleash Blood." If you position him facing the shoulder and your back towards the shoulder, as soon as he does the unleash, you should get launched pretty far back, far enough to make it on the peak and get the shoulder. Just wanted to say I managed to get to the shoulders and loot them WITHOUT saurok form. Having done so, I also want to say this is an awful, disgusting, horrible quest. What kind of idiot puts the shoulder spawn ON TOP a tall freaking peak? And I would describe how I got to them, but it's hard to explain. I started at the front of the mountain, to the left of the cave, in that little alcove type thing. It involves a lot of mount-jumping, dismounting, and jumping up between cracks. Awful. There's a mob called "Saurok Seadragon" that runs around on the beach just next to the location. It has the ability to throw a net at you and trap you on the ground and as soon as this is dispelled, a waterspout hit you and you are thrown up in the air. I lured him until I was just next to that rock (west side of it), and in that moment between the net and the waterspout I moved forward a little bit so it would throw me up and forward, thus landing me on top of the rock! Once I got the idea, it took me about 10 minutes to get it done, cause you still need to realize the proper place and do it right. Plus I don't know why, but sometimes the Saurok'd just disappear, and there's only one of him... so you gotta wait like 30 secs to "fish" another one. This is by FAR the easiest way to reach the Shoulder's if they spawn here! If you're one of the unlucky SOBs to have the shoulders spawn at 52.5 / 72.9 like I was, you know it's a pain to get. Seemingly impossible, it IS possible IF you have slow-fall. If you don't have it you can get a cloak-glider or a potion that can give you slow-fall. You will need it. Next, if you can't actually find it, it looks like it's in a cave; it's not. Back up and look up, on top of the mountain peak. You should see it and instantly realize why it's a pain. There is no way to get to it directly. However, if you look over to the peak beside it, you will see a large, red skull with a fire under it. This is where 프로제니투스 spawns. Follow that peak left and you will see a gradual decline. This is the path we take. The path starts a couple over at 50.5 / 74.8. Follow it up, across the narrow bridge, to the gap between the peak you're on and the one with the skull. If you mount up and make a running jump from to top of the peak, you should be able to clear the small gap. From there, move around 프로제니투스. You should be able to move around him without aggroing him. From the far edge, you should be able to see the shoulders. Pop slow-fall, mount up again, and make a running jump at the far peak. Once over it, disengage slow-fall by right-clicking the icon or you may over-shoot the peak. If you're not mounted for either jump, you will probably fall short. It is very easy to get the shoulder! i found out many hours after. after you do the dailys there whenever u kill a saurok u get transformed into one, so u will have the ability to jump very far . climb the peak next to the one that has the item and only jump , 5 min job if u played super mario :P .
Hello, it's a wonder that this isn't mentioned. Getting on the rocks to the shoulder is pretty hard for a non engineer or slow faller. In that way you'll be transformed to a saurok, wich will make you able to jump really far and high. This way you'll be able to get to every spawn point for the shoulder. 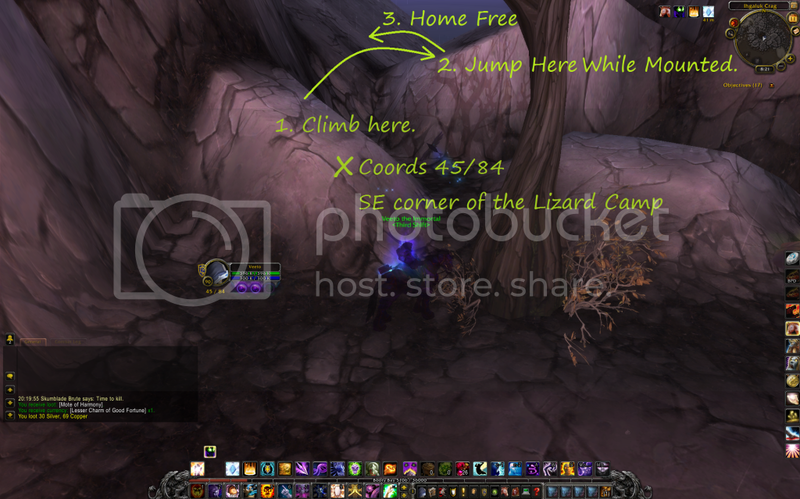 How to get there with nothing but your feet and a mount. After being very frustrated of not being able to reach the item despite being able to see it and having tried for 2 hours using different techniques, i contacted a GM about this issue. Some time later he told me that they kind of expect you to have the Saurok disguise active (which you get from another quest) during this quest. I told him that it's pretty poor design if one quest kind of requires another quest while it doesn't warn you about it, it's frustrating and saddening and far from fun, i asked him to pass on the note to the developers and fix it so that at the very least you're warned about this quest being nearly impossible unless you have some kind of jump mechanic either build in with you class/race/spec or using the Saurok disguise. Another way to get this when it's on the rock tops is to get a seadragon to attack you, stand close to one of the sloping rocks with your back to it. When he nets you it will also be followed with his water spout. Just as the net drops the water spout hits a second later. Move backwards just as it is about to hit, and it will launch you back and on top of the rock. Do it again to get to 2nd rock and you can run up the rest of the way. Hey, I was wondering if anyone has an idea how to complete the Crumbled Chamberlain quest. Since flying is not allowed in Thunder Isle, I can't complete this quest. I took this quest 3 days ago, found all the other parts except the Shoulder of Chamberlain which is on the top of a rock near the shore. So far I know it is impossible to climb there. It is also possible that I am missing a path that you can climb. First time when I found the item there, I couldn't climb there. Thus I waited for the next day in mind that may be the item will be relocated, but it wasn't. It was there for 3 consecutive days. Now I am stuck. I would really appreciate some help with this quest. Regarding some posts about the "impossible" one on the peak at 53.35, 83.51. I, as a Rogue, have found a way to get to this one, as have others probably. This one has Skumblade Filfthmongers littering the southern face, which provides a beautiful little exploit for us Roguers. Find the one that is as high up as they get - if there aren't any particularly high, wait for them to respawn, it usually takes anywhere from 5-10 minutes. Once you locate the highest up once on the right side if you face north, 그림자 밟기 to him and sap him. This will stop him from jumping down, as they do, so you can step to him if you fail. You may be able to jump to the rock to your right now, it is slightly lower than the platform you should be on, but to be safe I used a 고블린 글라이더 to glide about 2 meters forward, do a 180, and land on the lower edge of that platform. From there, jump to the higher up ones, and sprint from the highest one you can go to the lower edge of the massive platform that the shoulders are on. Hope this helps people get this. Similar concepts could also apply for other classes, such as druids, maybe warriors, but I am pretty sure charge will just bug. Good luck. All of the items are fairly easy to get (locations are listed by others), except the shoulders which took me a month of trying UNTIL I finally got the Saurok digues quest. I was able to get the shoulders in less than a few minutes yesterday - after a month of trying. So, I have to disagree with those who state you do not need the Saurok disguise quest to complete (took a month of dailies for me to finally get the quest). No, you do not necessarily need it, but I tried and tried with all the tips and suggestions to no avail. I have seen some obtain the shoulders without the disguise by watching their help videos, or written instructions. However, the disguise does make it much easier than using a mob's skill to help you; especially, when someone may not understand and tries to help you by killing the mob...thinking you need help! Found it on a rock on the side of one of the hills around that area closest to the water. If you are a hunter you can use disengage and demo locks can use demonic leap. I was able to get this when it spawned at the very peak mountain that is just above the two small cave entrances without having any special saurok suit or any other stupid %^&* blizzard has made us do. Saurok Seadragon and Saurok Brute both have a large knockback spell which knocks you back and into the air. If you follow the cliff (where the shoulders spawn) downward you'll find at the bottom a smaller rock that almost connects to it but is seperated by a gap (there is a fire torch in the ground right beside this rock). If you aggro one of these mobs and then place yourself on this rock in the right position, they will knock you over the gap and onto the next larger platform which from there you can easily just walk and pick up the shoulders. Unbelievably stupid that we have to do this to finish 1 quest, whoever designed this quest should be fired. You can get to the Shoulder at the top of the peak without any additional help, mobs or gizmos, just a 100% mount (and the guild perk certainly helps). Found one at 44.46 86.10. You can get this one by the water, its in a rock. The fact that you need to be on a different quest "The Skin of Saurok", to get the ability to jump, to get to the location of the quest item to be able to complete The Crumbled Chamberlain quest, is an absolute joke. I struggled with this for a full two days until it finally respawned atop a mountain, which i could jump to with my goblin glider from another peak. I spent a long time swearing at Blizzard for obviously bugging the Vargoth-quest thing that turns you into a saurok, allowing you to jump. I did it a long time ago, then went on a 4 month break and when I came back, the shapshift was gone. I filed tickets and what not, only to discover - today - that the Vargoth quest is re-given along with the other crag-dailies, starting with 이갈룩 바위산. For a Mages it's easy. You can ride up the rock beside the peak where the shoulders are without a problem. Once at the top, cast slowfall, mount up, then jump at an angle downhill but towards the rock you can jump up to. You will be then gliding over the rock you want to be on. Now point towards the shoulders and cast blink. You will blink right onto the rock. Now just climb up and grab them. Worked first time for me. I haven't seen it written in here, perhaps i didn't read it all. Keep doing daylies in Violet Rose if your alliance. At some point you'll get a quest named: Manipulating the Saurok. In this quest you'll get an illusion that transforms you in Saurok in this area. Find the torch at 50, 85 - just south of the cogwheel. Facing the torch (and the mountain) go to your right about 30 yards, until the face of the mountain stops being as flat and becomes more jagged. Look for the dark, vertical strips in the mountain where two faces meet each other. Simply find the shortest of these crannies each time, and jump. In only 3 jumps you should be on the broad, flat face of the mountain, with the item to your left. NOTE: The second jump will only succeed at a certain angle. If it seems like the second jump is just a hair too tall, keep trying at slightly different angles. Let me know if this isn't clear and I will make a video. I really think this was meant to be done with the saurok skin buff. Ok people was wound up about these suckers that I found that around 58 80 ish. Sunreaver popped down the beach at some point, so went to kill it. Realised with some accidental Seadragon pull that they do an awesome knock back. Now I don't have the Sauron Skin today, on this char. So after 20 minutes of yelling the c-word at the screen I thought: "Why not pull a sea dragon and see if his knock back could put me where I need to be. Oh eff yes it can! I pulled one, waited at the base of the ledge thing and then their knock back spell hit me and sweet infinite universe I'm standing on the damn shoulders. So I kill the Seadragon, loot the shoulders and do a little dance in my computer chair. Then I make sweet love to my fleshlight and chug a bottle of rum and go and hand the quest in. Yee haw! May the laws of probability benefit you! (Atheist 'good luck') Peace! Love you all! I flied from another mount(which you can get there by walking) at the south to this mount to get there with Goblin Glider tinker. Just seems a heck of a lot easier to use the form and hop around then fighting and getting attacked. got it today, at 44,83. go by the water, if you are not a lock or shammy, use the 하늘색 소금쟁이 고삐, really tiny but exactly was standing on 44,83 when i could click on it. Got the shoulders while doing another quest and looted a scumblade fleshripper and became one and while in this form went to 49 78 jump up the hill. While in this form your jump allows you to float a little. Who ever designed this quests is a masochist. No doubt about it. 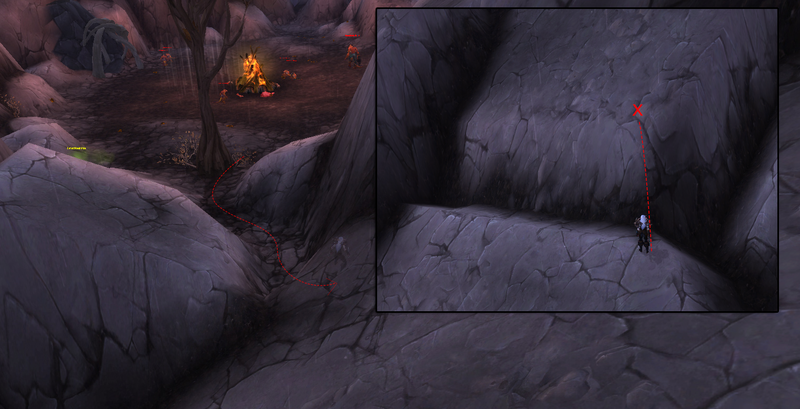 If you are a warrior ,you must lure Skumblade Fleshripper to top of that rock near Shoulder of the Chamberlain . Simply attack that creature and jump behind that rock where the shoulder is then use your Charge ability to get near to Skumblade Fleshripper . You'll never fail. I did it without mount, items or spells. You need that a creep running around, so NOT the elite rare one. That creep will throw a net and then a water sprout. With the water sprout you can go easily to the top of the mountain. Hopping 3 rocks totally. You need heal tho, because he keeps attacking with his spear. As a ww monk I used my basic heal spheres. Item is sitting on top of the peak in the Ihgulak Crag. It's the highest Peak directly behind you if you are facing the Summoning Alter for the Echo or Kros. Head back into the Crag and turn left. There will be a cave on your left as you turn the corner. 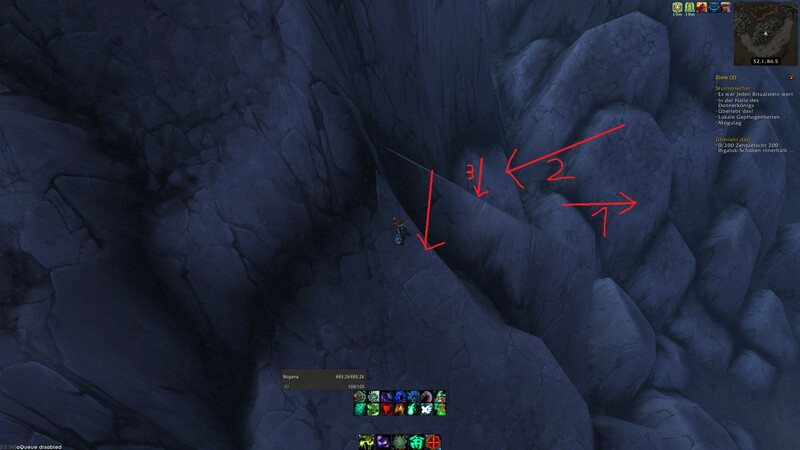 You will need to kill the Scumblade Shortfang and his Basilisk pet standing beside the cave, in order to get to the path to climb up. Once you get on the angled rock to the right.. you will need to make the jump over the gap. I was finally able to jump across the gap by drinking a Darkwater Potion. The plus 70% speed boost was enough to help me clear the gap. Found it at 57.8, 81.6 on a ledge to the east of the beach. There is a skumblade shortfang and his pet to the east (and northish) (left of the cave). Behind and to the left of it will be a rock with a crack on the left you can climb, Jump up to the flat part. From there use a mount to jump onto the small flat area to the right (west?). Then go to the high point and jump onto the next flat, it looks too steep to climb but it isn't. From here jump to the next flat spot (might be a bit tricky). There will be a short rise preventing you from jumping up to the final flat area. Look to the left and you'll see a crack. Mount up and aim for the highest part of the crack and jump. Climb to the top piece and you are there. Just did it a second time while writing this. Hope this helps. Another confirmed spawn point is 44.5, 86.1. Mine spawned at 45.4;79.3 > worst spot since you cannot fly in Isle of Thunder. So you wait for the Brute to call its Confidence of Kros and when he Brute Slams, the impact will actually push you on the next boulder (that jump you cannot make mounted or not ...) - I tried it 2 times in a row just make sure it can be done - both successful. The rock you climb on is exactly at 44.5; 81.2 right by the Disabled Sunreaver Construct; as you have the Construct to your left , look NE (towards the Shoulder of Chamberlain) , you will see 2 big boulders that kinda look the same but reversed angles > Climb on the left one! use the unleash blood attack as your jump too get to the far rock. For those who have their shoulders spawn around the 47,83. Go around to where Magister Yalis is hiding (45, 83). There's a tree where Yalis stops and sits by. Go behind that onto the rocks. Walk to the right corner area on the first rock (46.72, 84.90). Should be right in front of a 3 way crack. Face North and jump (or even walk) and aim for the corner of the rock that is above and to the left. There should be a slight ledge at 46.76, 84.67. Just keep jumping up until you get on the face of the rock. then run up to the shoulders. You can get to the shoulder without using the 사우록의 거죽 buff. You can simply go up to the hill where 프로제니투스 exists and use a slow fall ability, such as 공중 부양 or 저속 낙하. It is also possible to float over there with the slow fall ability granted by 노겐포저의 비약. Simply remove the spell before you go over the cliff the Shoulder is on. Provided it is spawned on the cliff. I found mine at 57.5 81.6. Numerous poster have pointed that location here. None however mentioned how they managed to get it. I tried for a good while trying to jump to get to it but it was nigh impossible. Finally after a while, I gave in and used 아비아나의 깃털 to get it. I might be missing something on how to jump to the darned thing. But if the only solution requires for you to use a crafted/quest item or a specific class skill to get to it, there must be something wrong or whoever designed the quest is a sadist. I don't know if anyone will read this.. But you don't need the daily to get the 사우록의 거죽 buff! You can just do /bow in front of 크로쉬크 ! That helps a lot. There is a way for characters with Heroic Leap to complete this one very easily. I used the 고동치는 피 구슬 to get to it. Ok.....so I know this is gonna tick off some, but hopefully you don't take it as bragging just help. Every thread here is right..if you wish to take the very long and painful route. Mine took exactly 30 seconds. I came up through the valley of the dead dinos, took a right into the saurok area, banked right down to the opening where the blood elf is walking around in his circle of white invisible light, and simply climbed up and dropped down. It was literally 30 seconds and fairly easy to get....I do hope this helps folks. It spawned at roughly 47:75 for me today. That's at the top of the mountain peak to the west of the peak that features the mounted skull. There's no way to the shoulders at this locat1on. I even used the Skumblade Brute's Brute Slam to knock me up two rock levels, but the third and final rock level is just too far from the second. I don't know of a way to get past this for someone w/out Heroic Leap or a Glider. When the shoulders are on the high peak at 53.20, 84.14 you can get up here from the west side by jumping while mounted, see screenshots. Between the big flat slab that is the top and the little slab at the west is a crack. Approach from the NW and jump into that and kind of angle towards the smaller slab. Once on the smaller westerly slab jump over to the big one. I uploaded an ss I guess it is pending review. for the ones at 50.85 i had to jump scale up onto the peak nw of this location at 45.83 kinda possible with some clever jumping to get up there, you need to get to the highest part (i had to glider down and around to get over the ridge wait 3 minutes for it to be up again). 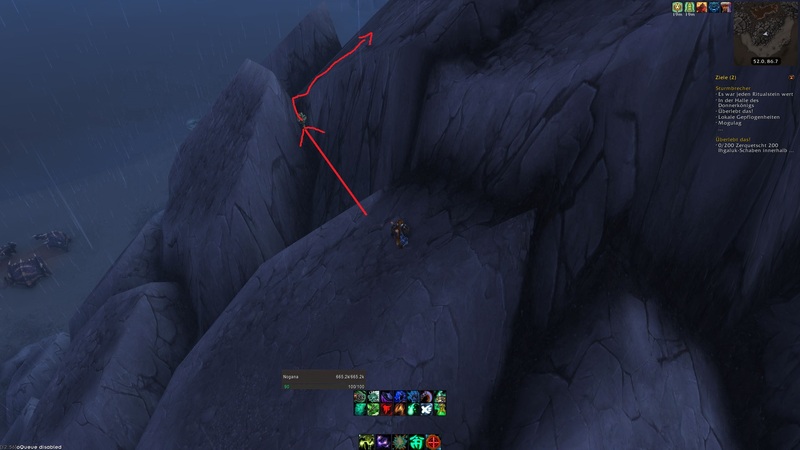 once at top get on a yak or some other mount that's tall and do a running jump / hit your glider you'll fall just under the peak for the shoulder but you can just wait for a glider again and get to the base of the rock one more time. And then its a simple going up a flat rock to the shoulder. Took me an hour to find this pacticular one, lucky for me they change locations on a daily reset. Last one i had was unable to be gotten to. Used http://www.wowhead.com/item=122124/darkmoon-cannon (luckily launched at first time) from the water to get above this quest item, and then just jumped down. "조금만 잘못 움직이면 돌덩이가 당신의 손에서 바스러져 먼지가 될 것입니다."